This sound library brings you over 300 MB of finely crafted sounds sampled from elusive, legendary bass machines and beat boxes. What you get are sounds from icon-instruments such as the Roland TR-808 and TR-909, TB-303, SH-101, and Juno-106. There are also banks from a collection of hot instruments by Sequential Circuits and Korg and more. If you're into techno, house, acid or trance music and are looking for the sounds to make the difference, then this library is for you. All the sounds necessary to make your tracks hammer have been definitively captured! 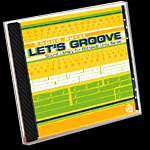 Let's Groove is a Mac/PC double format CD-ROM and is compatible with the BitHeadz Unity series software sampler only. They will give you a taste of the 122 banks included on the Let's Groove CD-ROM.